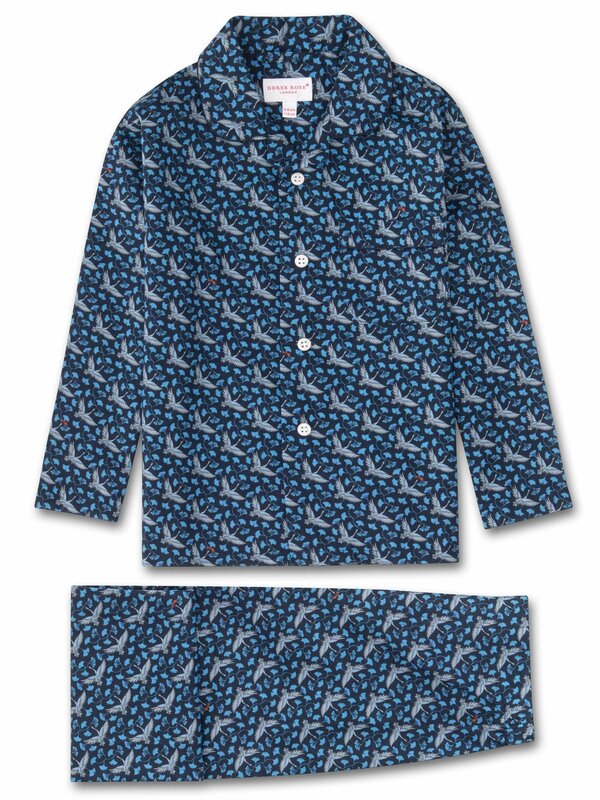 For a fun addition to their sleepwear, the Ledbury 15 kids' pyjamas feature a repeated light blue and white coloured Japanese crane in flight - with some birds even enjoying a fish along the way. A favourite of our customers for its breathability, lightweight properties and luxuriously soft feel, our cotton batiste fabric has become a signature of Derek Rose quality. A dream for them to lounge or sleep in, the Ledbury 15 will keep your little ones comfortable when they need it most. Crafted to keep them looking their best, whether it be for winding down before bed or for breakfast around the table in the morning - we've kept things simple for our kids' pyjamas, with a smart, rounded collar with revers, one breast pocket and plain hems on the sleeves. The pyjama top is fastened with buttons and piped in complementary navy blue, while the trousers have an elasticated waist for ease and comfort.